What a beautiful week it was! We were on the Norwegian Sky cruise ship with 400 other people from the Florida Assn. of Computer User Groups: FACUG, as well as the Assn. of Personal Computer User Groups: APCUG. We watched presentations on Windows 8 and Cloud Computing, and we gave presentations on Picasa and Smartphones. See the article below to learn how we got online while we were on the cruise and the price we paid! Another participant in the conference cruise was Dave Graveline of the Into Tomorrow technology radio show. They’re celebrating 17 years of their radio show covering the latest in consumer electronics and technology. Click here to listen to the show they recorded from the cruise ship – it’s the red box in the right sidebar labeled ‘Listen to Our Show’. You’ll find our interview in the second hour starting at 11:43. We thoroughly enjoyed ourselves! We think Dave did a great job with the Interview. Thanks Dave! Come to the Techno-Geek Learning Rally and learn about Computer Maps, Digital Photography and Staying Connected as you Travel. Small groups, Windows, Macs, and Smartphones. 6 days of relaxed learning, hands-on assignments and lots of food and fun! April 22-28 2012 in Bushnell, Florida. Keep up with us in between newsletters by following our Facebook page. You’ll have fun and learn by answering our Geeks On Tour Jeopardy questions! If you go to www.facebook.com/geeksontour you will be able to see everything we post there. It is a completely public page, you do not need to be a member of Facebook, but if you are on Facebook, you can click the ‘Like’ button, then our posts will show up on your Facebook home page Newsfeed. Do you have questions like this? If you are a paid member of Geeks on Tour, you can ask anything you want in the forum. Mr. or Mrs. Geek promise to respond, and we have several other knowledgeable members who will add to the conversation. If you’re not a member, Join Now. The picture at right is of the dome which covers the satellite dish on board the Norwegian Sky. When you get over the disappointment about how slow and expensive it is, you really must marvel at how magic it is that it works at all. I remember when we had the Datastorm Internet Satellite dish on the roof of our RV. It made our RV lifestyle possible back then. Making a satellite connection for Internet is a much greater feat than those for TV because, for TV, all you need is to Receive the signal. For Internet, you also must be able to Send. It’s a 2-way signal. Getting the dish on our RV to hit the correct satellite, 22,000 miles away, took some serious fine-tuning, and a stiff wind could knock it off signal. How the heck they get that technology to work on a ship at sea is beyond me! Companies who provide Internet for cruise ships and large yachts are MTN, KVH, and Inmarsat. But even people on small sailboats, African safaris, and Himalayan treks can get Internet using Satellite phones and service from Iridium. The phones will set you back at least $1,000, and you can also rent them by the week for $50 – $100. It’s the service that is the expensive part. How long do you think it will take until we all have inexpensive ‘communicators’ (a la Star Trek) which work from anywhere? Published by MrsGeek, in Newsletter. 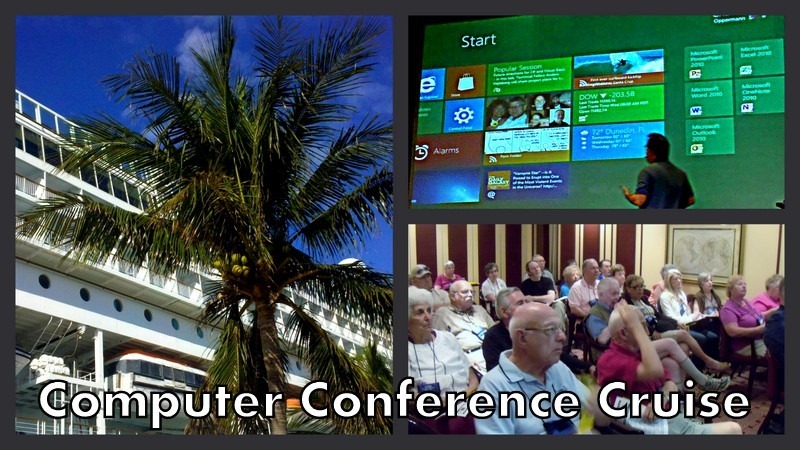 Tagged with Geeks on Tour Interview, Internet on Cruise Ship, Into Tomorrow, Techno-Geek Learning Rally, Verizon Roaming.